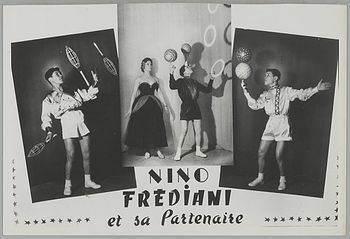 The juggling world has lost one of its most famous and well-liked members, Nino Frediani. 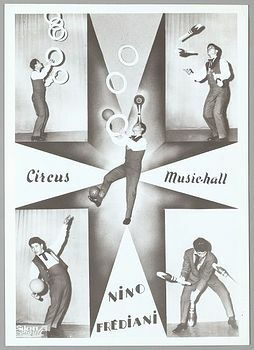 Coming from an Italian circus family that traces its origins back to 1650, Nino was born in a dressing room of a Portuguese circus in 1940 in Libson. His mother and father were performing in the ring when she felt her first labor pains. Nino was born shortly after in their dressing room. 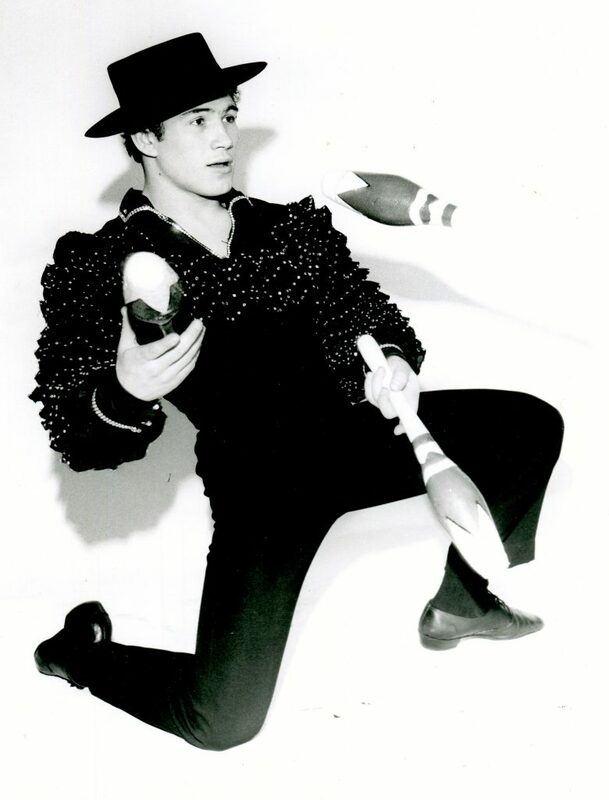 He picked up juggling at age four or five along with many other skills. By the time he was eight years old, he was performing five acts. 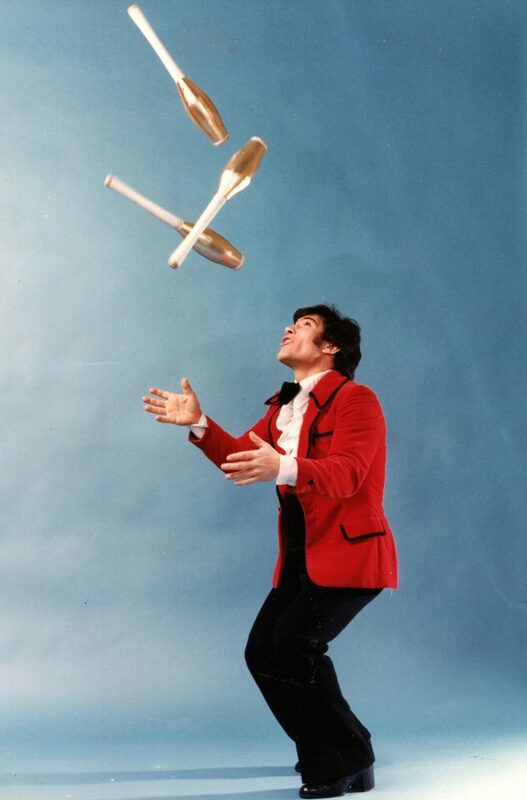 He learned trapeze, free standing ladder, rola bola, horse and elephant training, acrobatics, and his favorite, juggling. He never attended school except for 6 weeks, when he was forced to do so by government officials. Nevertheless, his parents taught him to read and write and he was fluent in 6 languages! 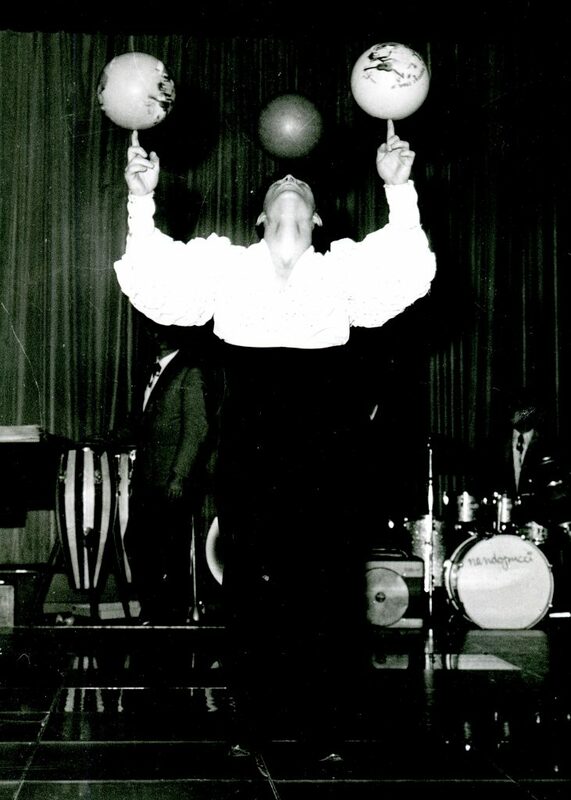 When he was 18, he took on his first solo job, juggling weighted balls, rings, and clubs underwater as part of the 1958 World Exposition in Brussels. After that, he began working nightclubs. He developed a fast act that would work well on small stages with low ceilings. 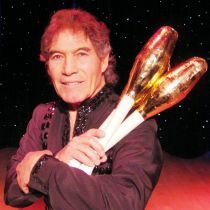 He also worked in variety theaters with famous acts such as Tom Jones, Shirley Bassey, and Sammy Davis Jr.. 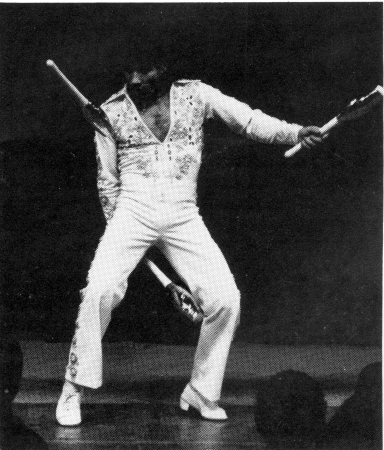 He toured all around the world throughout the 1960s and 1970s. 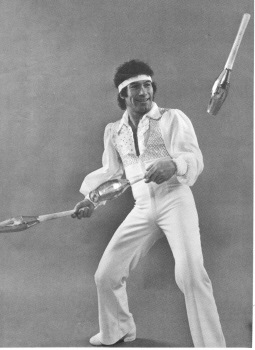 In 1972, he started being billed as the fastest juggler in the world due to his three ball and three club work. His act started out with 30 seconds of fast three ball work. This was followed by amazing work with big balls, juggling, rolling, bouncing, and spinning them in a wide variety of ways. Three clubs with very fast spins and tricks came next. ending with kick ups. 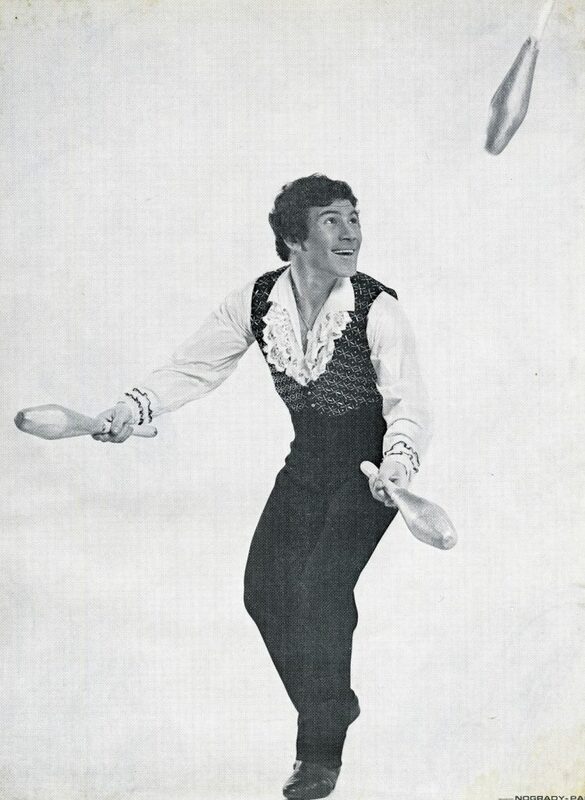 For the finale, he presented the routine that he is best remembered for – his three ring act. Nino juggled the rings like hats, throwing them with pancake flips and catching each one over the head after removing the previous one. 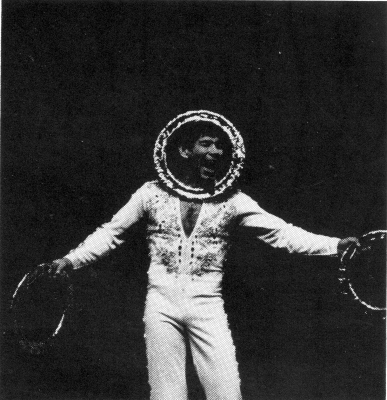 In 1968, he began passing the rings out to audience members, who would toss them back as Nino attempted to catch them around his neck. The sight of him diving across the stage to catch the rings around his neck became Nino’s signature trick and added some great comedy to his act. His act could last as long as 14 minutes and was filled with his amazing stage presence and charisma, amazing tricks, and comedy. In 1980, Nino came to Las Vegas and became an instant hit. 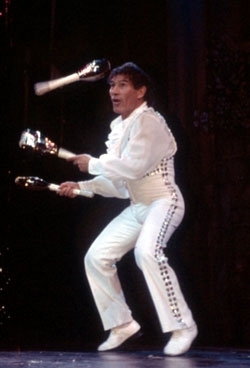 He worked in Las Vegas for the rest of his career, performing over 20,000 shows there. During his very long career, he performed with many of the biggest names in show business, such as Frank Sinatra, Elvis Presley, Bob Hope, Diana Ross, Paul Anka, Bing Cosby, George Burns, Dionne Warwick, Charleton Heston, and many others. He performed for the Queen of England twice. 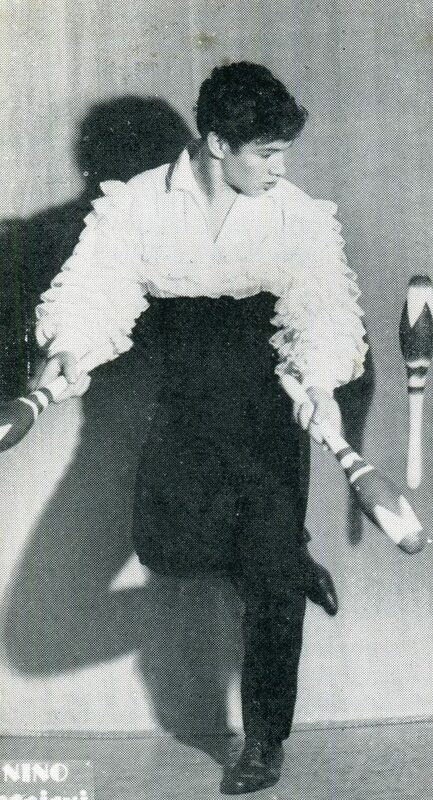 In 2010, Nino was awarded the Historical Achievement Award by the International Jugglers’ Association. He retired in 2017 after spending 75 years in the spotlight. All of these accomplishments are amazing by themselves, but they seem almost unbelievable when you learn a secret that Nino kept for most of his life. Nino was born with chronic dystrophy of the optic nerve, meaning that he spent his entire life legally blind! He couldn’t drive or make out the faces of friends or family, as he only had about 10% of normal vision. He covered his props with bright gold decorations so that he could see the glint off of them under the bright stage lights. For those who saw his act and later learned of his condition, it was truly a remarkable discovery. 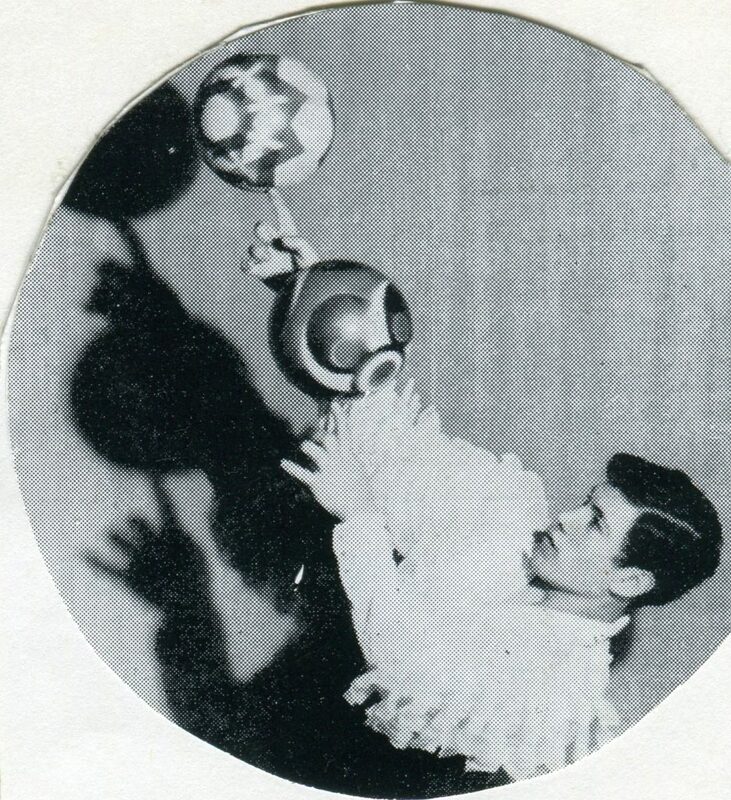 Nino was very close to juggler Pepito Alvarez, who is the godfather to Nino’s son Romano, who is now a successful juggler himself. Nino leaves behind his wife Kinuko, three children, three grandchildren, a great granddaughter, two ex wives, and many, many friends. Our condolences go out to all of them. If you never had the opportunity to see Nino perform, please check out the following videos. You won’t be disappointed. Click here to see his act from 1973. Click here to see his act from 1977.